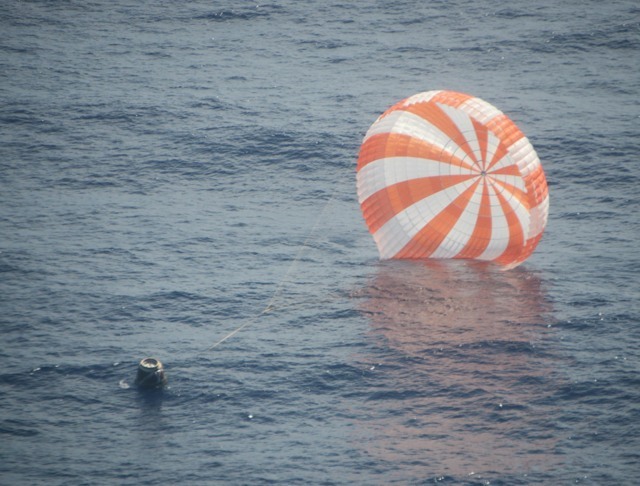 The SpaceX Dragon capsule safely returned to earth, or more accurately, to sea today, splashing down in the Pacific Ocean off the coast of Baja at 12:22 PM PT. The return marks the end of NASA Commercial Resupply Flight number 1, and a conclusion to the first official commercial supply run to space in history. Future cargo trips, whether to private stations, the Moon, Mars, outer planets, or perhaps somehow, even other star sytems will in a very real sense be able to trace their origins back to this moment, as well as the equally successsful COTS 2/3 “test” flight which preceeded it. How soon any of that happens depends on a rapidly changing environment. By the time the next Dragon launches, currently scheduled for late January, much will have changed in the world. The last Space Shuttle, Atlantis, will be in its final home at the Visitors Complex at the Kennedy Space Center, the U.S. Presidential election will mercifully be over, and presumably, Orbital Sciences will have completed its first test launch of the Antares rocket, revealing just how far the already striking success of the COTS/CRS programs will extend. There are currently 11 more scheduled CRS missions for SpaceX, but with both the Commercial Crew program still in development, and a senior NASA group reportedly promoting an extension of ISS operations until 2028, this is only the start of something big. One can only wonder how many more succesful missions will be required before the lessons of COTS are incorporated into plans for journeying beyond low Earth orbit into the rest of CIS-lunar space. For now however, congratulations to the entire SpaceX team, as well as the people at NASA and their supporters in Congress who made this program possible. The future’s looking better every day. 2 Comments on "Once More, A Dragon at Sea"
NASA is currently paying $133.3M for each SpaceX mission to the ISS, with NASA stipulating a new Dragon spacecraft for each mission. The current CRS contract runs through 2016, so regardless if the ISS is extended they will need to buy additional cargo deliveries. I think SpaceX would be in a position to offer deliveries with their fleet of once-used Dragons, and since they will be offering a service they already know the fixed costs of (unlike when they negotiated the current contract), I would suspect that they will offer a per mission price far less than $133.3M. Lowering costs for supporting our efforts in space is critical if we truly want to expand our presence in space. Costs could down even further if SpaceX is able to reuse their Falcon 9 1st stages. While that could be a few years down the road, these trends provide pricing guidance for those that want to eventually test out their ideas for space-based businesses and services.